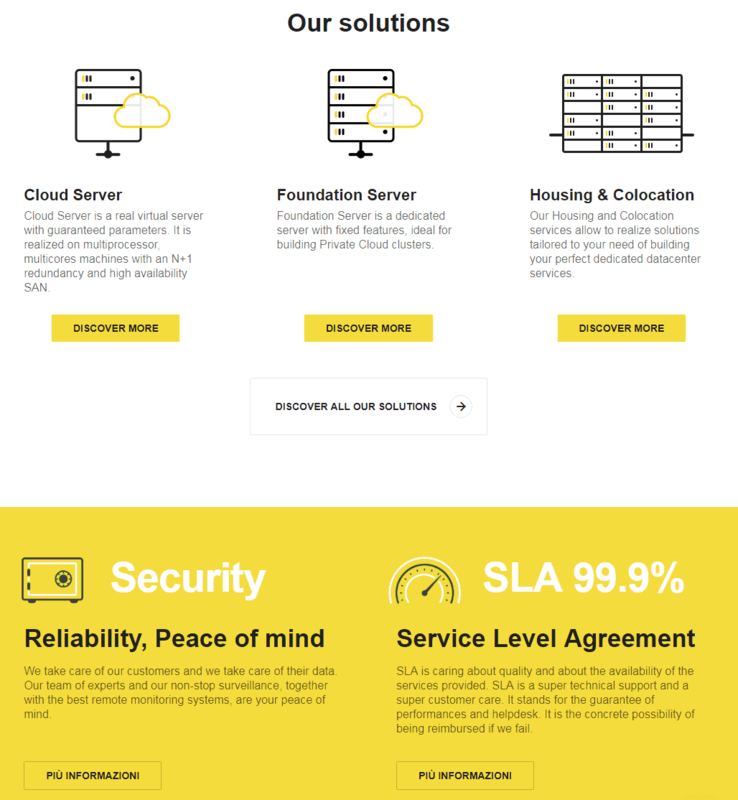 Seeweb Review 2019: Is Seeweb a Good Hosting? Seeweb offers impressive cloud services and an average website hosting services, where you can add different add-ons for an added fee. Seeweb is an Italian company with five data centers in Italy and one in Switzerland. The key features of their hosting services are custom cloud packages, maximum security, and high-quality equipment. What makes Seeweb special is the redundancy they have achieved in their entire system. Their connectivity providers include GTT, NTT and Cogent Communications. These multiple providers ensure the system is never down and the customer is provided with his desired system requirements all the time. One of the most popular control panels today, Plesk, is also offered for an extra charge. With Plesk, you can manage your domains and customer accounts easily and efficiently. It is easy to install Plesk on your server and then integrate it with additional options, ensuring you utilize its full potential. They provide three different types of SSL certificates for a yearly fee. All the certificates are Single Root and issued by the Equifax Secure Certificate Authority. They are compatible with almost all the modern browsers and offer up to 256-bit encryption. You might have trouble finding the SSL packages. The main link was down when I tried to look at them but the link in the footer was working. I was really unimpressed when I tried to find out what packages they offered. They only have one package each for both Linux and Windows based hosting accounts, but you can change specifications like SSL, email account, and databases to your liking. As I changed those specifications, the price did not change accordingly, even though it clearly states that those added specifications cost extra. It is possible they add the total on the checkout page. They only offer yearly payments, take a weekly backup, offer 10GB disk space, and 1TB bandwidth per month in all of their packages. Seeweb can be reached by telephone, email, fax, and live chat. I tried to get in touch with them through the live chat. I got the impression that they only offered chat in the Italian language. So I asked if they could answer my queries in English. I got a reply after 15 minutes asking me to contact them through email. They also have active facebook and twitter accounts. Additionally, the F.A.Q. section quickly answers the most important questions while the Guides section contains detailed guides on most of the services they provide. Seeweb’s own website leaves a lot to be desired considering they are a company that helps people with their websites. With no trial accounts or money back guarantees, and only early payments possible, it is quite a tough decision to opt for their services. My recommendation would be to ask them to allow you to test their services first, as they certainly don’t make the best first impression. Wondering how Seeweb stacks up against other Web Hosting companies? Enter any other Web Hosting company and we will give you a side-by-side comparison.